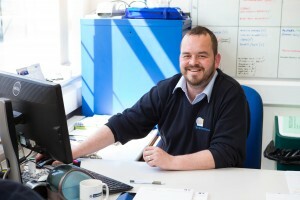 Andy has been at Yorkshire Laser for two years. In that time he has been promoted from the shop floor to Production Manager. His time, both at work and home, is equally demanding and rewarding as he is the proud father of two young children. He enjoys the daily challenges of working at Yorkshire Laser and the diversity of his role, but predominantly it’s the people that make it a great place to work. After a busy week at work, Andy relaxes by playing golf. He has been a dedicated LUFC fan since birth and cites John Charles as his favourite player – he is adamant that one day they will return to their glory day’s form! He is a keen ‘DIY-er’, enjoys reading Dan Brown novels and listening to Hot Chip.